There's one thing that the staff at Currabubula Pub & Cafe are extremely proud of, and that's their coffee! No stone has been left unturned to produce the best coffee on either side of the Great Divide. Cappuccino, Latte, Mocha, Espresso, Hot Chocolate, Babycino, Milk Shakes and Smoothies. Currabubula Pub & Cafe's special blend of quality beans, local fresh milk, filtered rainwater and trained Baristas is the ideal recipe for a perfect cup of coffee. We've recently introduced a Coffee Loyalty Card – once you've purchased nine coffees – the tenth one is free. And if you're in a rush, you can even phone ahead and have your coffee order ready to pick-up! And as for the cakes, well they're to die for! With a huge variety to choose from, there's sure to be something for everyone, yum! We have a beautiful selection of light meals, including hot pies and sausage rolls, salad rolls and wraps – all made fresh on site – great for a lunch on the go, or a quick snack. 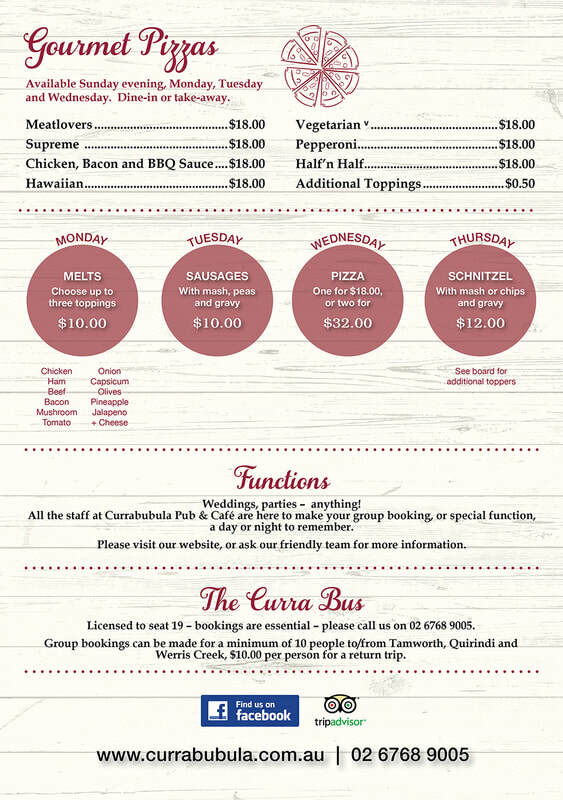 The Currabubula Pub & Café's Restaurant provides a stunning Peel Ranges panoramic backdrop while you enjoy one of our delicious a la carte meals, or perhaps one of the 'Chef's Creations' when you feel like something special. During the cooler months we light the wood fire, the perfect place to unwind while perhaps indulging in a hearty counter meal. We also have kids' meals and a selection of teas and other drinks suitable for children as well.